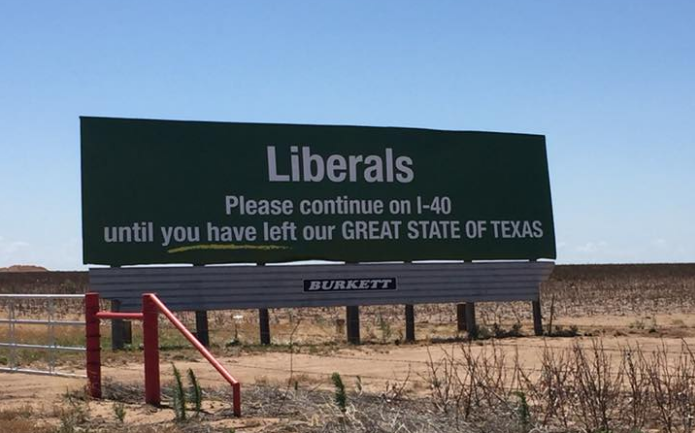 There's a new billboard along the interstate near Vega that says “Liberals Please Continue on I-40 Until You Have Left Our GREAT STATE OF TEXAS,” and it's drawing crowds on the internet and in person. The billboard was posted to Facebook with several thousand likes and shares already, where it's going viral on social media. This isn't the first time that we've seen hilariously clever billboards depicting political messages in America though, but the difference being when Democrats do it, they put despicable messaging in place for shock value. Let's look back at a few examples. Liberal vandals in Las Vegas defaced a billboard back in March, where they manipulated an advertisement for a gun range. Alt-Left groups defaced the billboard to display the disgusting message. Then, a Democratic PAC in Pensacola, Florida paid for a billboard labeling the National Rifle Association as a “terrorist organization,” despite not a single NRA member ever being responsible for a mass shooting. The group behind the billboards is Mad Dog PAC and they are funding similar billboards across the country calling out GOP candidates and President Trump. While the left, clearly, is filled with hatred, when Conservatives make these signs they tend to use humor. There was a sign in California which said, “Welcome to California! Official Sanctuary State! Felons, Illegals, and MS-13 Welcome! Democrats Need The Votes,” of which also went viral creating laughter at the truths of the deep-blue sanctuary state of California. The sign’s creators to this day remain anonymous. There's a far cry from comedy to hatred, and clearly, Conservatives are much better at this type of comedy. Hands down, Trump supporters win again. Liberals - Please continue north till you leave the US northern border, and DON'T come back! "Liberals SHOT, survivers prosecuted" sign. Got to love Texans and Texas. Feel pretty much the same way here in Tennessee.